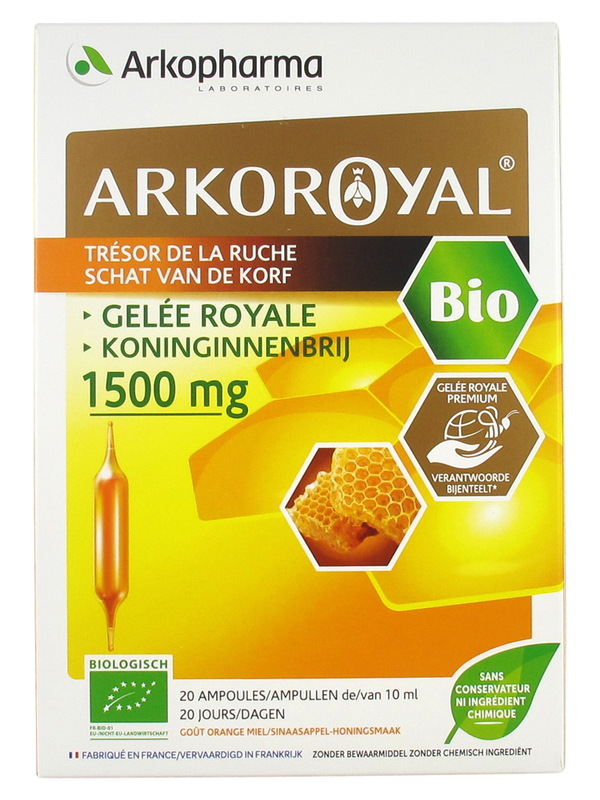 Arkopharma Arko Royal Royal Jelly 1500mg Bio 20 Phials is a royal jelly-based strengthening solution, with orange-honey flavour. Qualified as "celestial remedy", royal jelly is the result of a miraculous alchemy between the vegetable and the animal kingdom. It is produced by bees from the hive in order to nourish their queen, hence its name. This food enables the queen to live 40 times as long as the other bees. Source of vitality, the drinkable preparation Arkopharma Organic Royal Jelly is notably based on Royal Jelly and it is an ideal reconstituting for all: children, adults, elderly people and athletes. 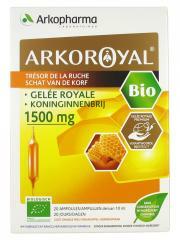 A phial brings a revitalising amount of 1500 mg of Organic Arkopharma Royal Jelly. Guaranty free from alcohol, from dye, from preservative. 20 phials of 10 ml. Certified AB by ECOCERT, resulting from organic farming. Take 1 phial per day in the morning with breakfast. It is advised to dilute the content of the phial in a glass of water or fruit juice. It is possible to repeat the cure several times in the year. Indication: Vitality. Adults, children elderly people, athletes. Eau, Gelée Royale**, Sirop de Blé**, Miel**, Jus d'Orange concentré** (Citrus Sinensis L Osbeck). ** ingrédients d'origine agricole obtenus selon le mode de production biologique.